This is part of the 108.8 metres of The World's Biggest Hexagon Quilt as it was displayed at the Gatton In May 2010 Quilt Show. It was here that the official measuring for the Guinness Book of Records was undertaken. 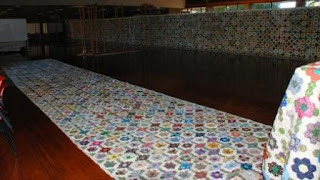 These 152,636 hexagons were hand pieced and received from 19 countries around the world. Now two months later we are about to cut it up into single and lap sized quilts, bind them and distribute to Local Nursing Homes and others in need throughout the Lockyer Valley. Don't you just love hexagons?! I do!!! That's an amazing feat! Congratulations!!! Thanks for visiting my blog. Yes, you do have to make my Hexie Caddy Pincushion,,a perfect watching tv caddy! Remember to blog about it and let me know!